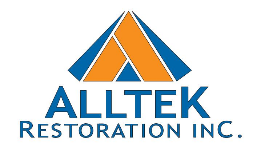 You can only expect a professional staff when working with Alltek Restoration, Inc. We value and expect quality, efficiency, punctuality, cleanliness and courtesy. Our team believes in our commitment and dedication to each client’s satisfaction is second to none. Detailed estimates upon invitation to bid. Alltek has established successful working relationships with qualified and competent professionals, and subcontractors who share our customer oriented philosophy. Our Guarantee: We warranty all work that is done with your project whether we ourselves do the work or our subcontractors do the work. Contact our office in Antioch, CA, at 925-732-7208 to speak with one of our construction designers about your upcoming project. Our production staffs quality and efficiency is unmatched. Ninety-five percent (95%) of all repairs are performed by Alltek staff. We are both general building and electrical contractors. We employ skilled and trained tradesmen to perform our construction repairs allowing us to have better control of project schedules and overall performance. By completing the project with Alltek staff, we manage the projects, the project does not manage us.